Intrepid Control Systems » Analog DAQ Devices Analog DAQ Devices | Intrepid Control Systems, Inc. 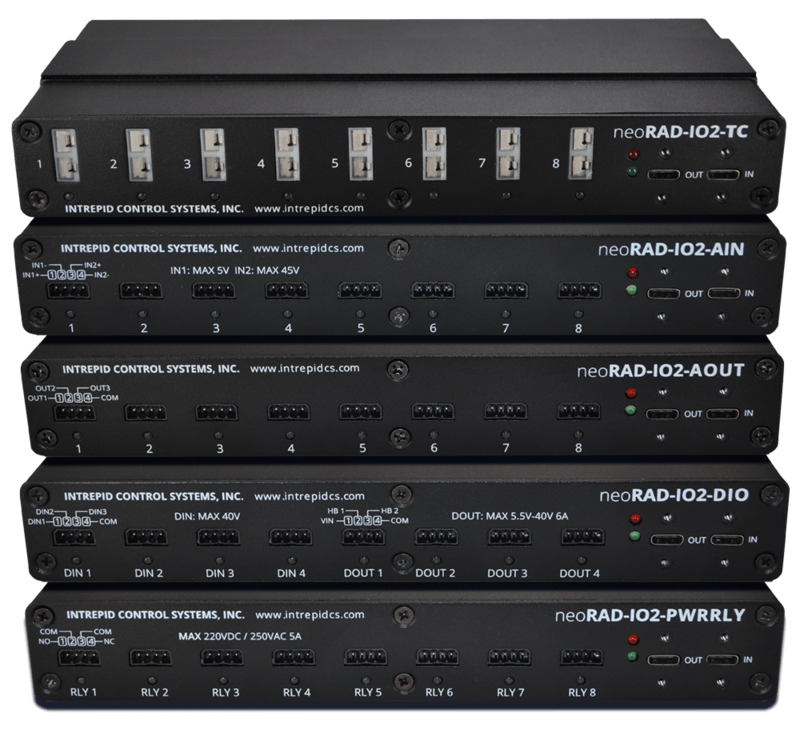 The RAD-IO2 series is a family of ruggedized products that provide an isolated analog, digital or temperature interface to a PC via the PC’s USB port. These tools can also be paired with Intrepid products that include a USB port such as neoVI ION, neoVI FIRE 2, RAD-Galaxy, and RAD-Gigalog. In addition, the RAD-IO2-CANHUB can power and convert the native UART signal to CAN or CAN FD for use in any CAN device. The RAD-IO2 family communicates on an open source UART based serial communication protocol. Up to eight devices can be daisy chained. The chain length is limited by current supplied to the chain through USB. All RAD-IO2 devices have input to output isolation, and 2.5kV isolation between each of the eight banks. Bank to bank isolation is important because it allows the common mode voltage of each input signal to be different than the other channels in other banks. (This is a major source of measurement error and can damage to the product.) Additionally, noise on one channel will not affect other channels. Read on below for more information on each device. Each bank has two sets of inputs, low and high voltage; Only one can be accessed at a time as a channel. The first 4 banks are isolated inputs, with three 0-40V 12bit ADC inputs per bank (12 total) which can be configured as analog input or digital input with a programmable threshold (in 160mV steps). The second 4 banks have two digital outputs that can be configured as separate digital channels or as an H-Bridge output. 8 total. Each output can pass 5.5V to 40V at 6A (user supplied).